Feel free to browse my photo galleries below. If you’d like shirts or hats browse my online shop. A few years ago, Lukasz met Mike Alexander and swore to him he would have the baddest Luv to ever grace our cover, and that he wasn't going to let anything stop him. So, true to his word, he got to work on what would be a non-stop action packed build. In order to accomplish his goal, Lukasz started out with a Toyota. Then, he hung his Luv body on it, body-dropped the snot out of it, and slammed a bitchin' motor into it. 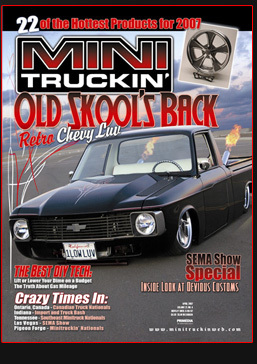 Mini Truck & Car Photo Galleries.